:"How can the contents of a book written so long ago have anything to do with me?" some might ask. The truth is that Luke's narrative of the first century church is just as relevant today as the day it was first penned. Its message is needed just as much, and its impact has not faded over the generations. In the words of author Eddie Rasnake, "The book of Acts are more than mere history. It is full of life principles for today to guide the church and the Christian's walk!" The desire to learn from the first century church prompted Eddie to search out the practical life principles within Acts and their timeless applications. The Book of Acts, part 2, is a twelve-week interactive Bible study that covers every single verse in the last sixteen chapters (Acts:13-28) of Luke's Biblical record, centering on the Apostle Peter and the early church. Each week's lesson digs deeply into this treasure trove of spriritual principles called "Acts." As you walk verse by verse through its chapters and become intimately acquainted with all its wealth, you will learn the results of the Holy Spirit coming to dwell in believers and how the gospel spread from Jeruslem and Judaea to the uttermost parts fo the world. Leader's Guide included in the back. 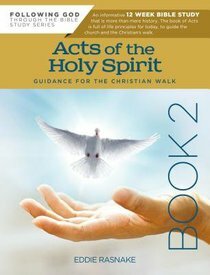 About "Acts of the Holy Spirit 12-Week Interactive Study With Leader Guide (Book 2) (Following God: Through The Bible Series)"